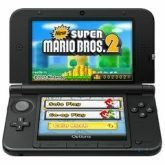 The Nintendo 3DS XL as well as the highly anticipated Super Mario Brothers 2 game is now available for purchase in the United States. The new handheld game console is bigger, can be played in 3D, has a longer battery life, a bigger 4.8-inch screen, and comes with a 4GB SD card (as opposed to the original’s 2GB SD card). The Nintendo 3DS XL can be purchased in-store and online at many locations such as Toys R Us, Game Stop, Amazon, Walmart, and Target for an average retail price of $200. As for the new Super Mario Brothers 2 game, it is expected to be an absolute hit with 80 entertaining levels and even a few exciting new power-ups. Examiner.com has given Super Mario Bros. 2 an 8.0 out of 10.0 in their thorough review of the game. Super Mario Brothers 2 retails for an average price of $40 and can generally be purchased where Nintendo game consoles are sold. What do you think of the new Nintendo 3DS XL? Leave your comments below!